The territory of Nunavut was created in 1999 as part of the Nunavut Land Claims Agreement between the Inuit and the Government of Canada. The goal of Article 23 of the Nunavut Agreement was to increase Inuit participation in government employment in Nunavut to a representative level in the population. Currently, although the majority of Nunavut's residents are Inuit enrolled under the Nunavut Agreement, only half of government employees are Inuit. New findings from the 2017 Aboriginal Peoples Survey–Nunavut Inuit Supplement (APS–NIS) provide information about availability, interest and preparedness of Nunavut Inuit for employment in government in Nunavut. The target population of the APS–NIS is Nunavut Inuit living in Canada aged 15 years and older. While the sample includes a small number of Inuit living outside of Nunavut, this report focuses only on those living in the territory. The Aboriginal Peoples Survey–Nunavut Inuit Supplement was conducted from January to August 2017 as a component of the 2017 Aboriginal Peoples Survey (APS). The supplement was targeted at Inuit enrolled under the Nunavut Agreement, aged 15 years and older, and comprised a large supplementary sample of Inuit in Nunavut. An additional set of questions was included to learn more about the availability, interest and level of preparedness of Inuit enrolled under the Nunavut Agreement for government employment. Questions were developed in collaboration with Nunavut Tunngavik Incorporated, the Government of Nunavut and Employment and Social Development Canada. As part of the survey, an Inuit Hiring Strategy was developed in Nunavut to recruit local residents to work with Statistics Canada as interviewers or guides. As a result of this strategy, almost 80% of the APS collection team were locally hired from communities across Nunavut. Nearly one in two Nunavut Inuit (47.4%) were employed; 11.7% were unemployed and 40.9% were not in the labour force. Of those Nunavut Inuit who were employed, more than half (54.7%) reported working for government in Nunavut (either federal, territorial or hamlet/municipal). Within the public service in the territory, the Government of Nunavut was the largest employer of Nunavut Inuit (56.6%), followed by hamlet or municipal governments (34.3%). 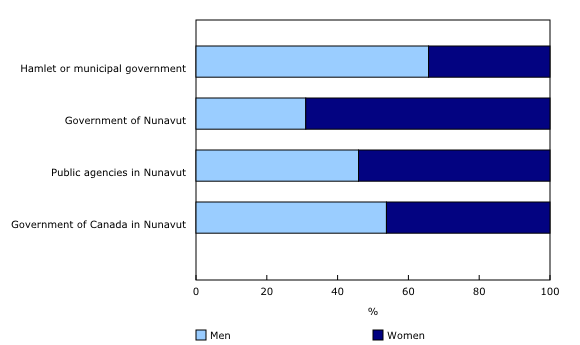 The Government of Nunavut was predominantly composed of women (69.0%), unlike the hamlet or municipal government, which had a higher proportion of men (65.7%). Results from the APS–NIS showed that there was a strong interest among Nunavut Inuit aged 15 to 54 in working for the public service. Of Nunavut Inuit who were not currently working for government (including non-government employees and those who were unemployed or not in the labour force), more than 8 in 10 (85.1%) were interested in public service employment. Women and men showed similar interest in government employment. 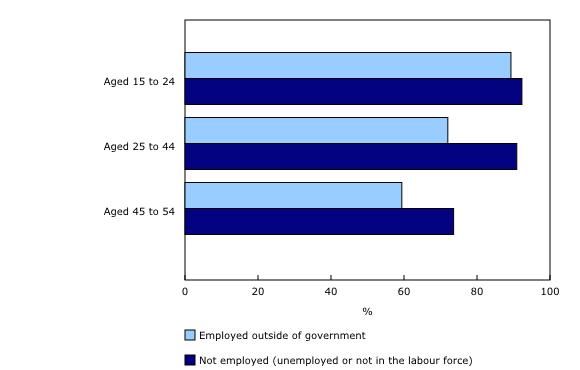 Among Nunavut Inuit aged 15 to 54, two-thirds of individuals mentioned pay and benefits (other than housing) as a reason why government employment interested them. The second most reported reason was the type of work tasks or duties such as meaningful work, helping people and working with the public (40.3%). Among Nunavut Inuit aged 15 to 54 interested in government employment, 61.2% planned to pursue formal schooling within the next five years. The most common education goals reported were college, Nunavut Sivuniksavut program, or non-university certificate other than a trade certificate (47.4%); completing high school or upgrading (46.7%); as well as a trade certificate or diploma (27.9%). Two-thirds of Nunavut Inuit aged 15 to 54 interested in government employment reported no difficulties or challenges in pursuing further education. However, for those who did report difficulties, the three most commonly cited ones were childcare (33.5%), other personal and family responsibilities (23.9%) and lack of confidence or preparedness (16.1%). More women reported challenges due to childcare (79.8%) and personal or family responsibilities (60.8%), whereas lack of confidence and preparedness was more commonly reported by men (54.0%). One-half of all Nunavut Inuit aged 15 to 54 had formally applied at least once for government employment. Of those who had applied, one-quarter reported that they had experienced difficulties or challenges when applying. The three most commonly cited difficulties were not receiving any feedback from the employer after applying (36.5%), the hiring process was unfair (24.9%), and not being able to meet the education, work experience or equivalency requirements (23.3%). Nunavut Inuit aged 15 to 54 who had past government work experience but who no longer worked for the government reported positive experiences working for the government. Overall, 90% reported that they were satisfied or very satisfied with the respect for Inuit culture, values and language at their last government job and 85.9% were satisfied or very satisfied with the relationship with their direct manager or supervisor. Just under three-quarters (72.7%) reported that they were satisfied or very satisfied with the career advancement opportunities provided within the government. Among those currently not employed by the government, 41.3% reported that they had previously worked for the government. The reason that was most often given for no longer being employed by the government was that their term, casual, seasonal or contract position had ended (51.6%). Nine out of ten past government employees reported that they would be interested in working for the government again in the future. Estimates from the 2017 Aboriginal Peoples Survey (APS) and the Aboriginal Peoples Survey–Nunavut Inuit Supplement (APS–NIS) should not be compared. While the APS includes all Inuit living in Canada (as well as all other Aboriginal groups), the APS–NIS includes only Inuit enrolled under the Nunavut Agreement. In addition to the different target populations, the two data sources have different objectives, sampling designs and weighting strategies, which may result in differences between estimates. For more information about the differences between the two data sources, see the APS–NIS web page. Inuit: For the Aboriginal Peoples Survey, people can self-report Inuit as their Aboriginal identity. For the APS–NIS, Nunavut Inuit are more specifically defined as Inuit who reported being a beneficiary of an Inuit land claim agreement and who responded "Nunavut Land Claims Agreement" to the question "Which Inuit land claim agreement are you a beneficiary of?" The Nunavut Agreement, formerly known as the Nunavut Land Claims Agreement, is an Agreement that was signed in May 1993 by Nunavut Tunngavik Incorporated, the Government of Canada and the Government of the Northwest Territories. The terms of enrollment are defined under Article 35 of this agreement. One goal defined under Article 23 of this Agreement is a commitment to hire and retain more Inuit to work for the government by providing training or other support. Employed refers to persons who, during the reference week, did any work for pay or profit or had a job and were absent from work. Unemployed refers to persons who, during the reference week, were without work, were available for work and were either on temporary layoff, had looked for work in the past four weeks or had a job to start within the next four weeks. 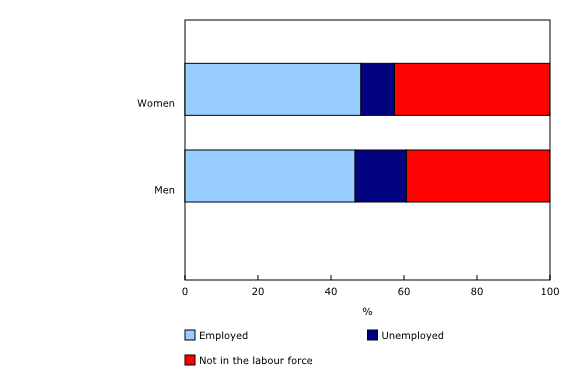 Not in the labour force refers to persons who were neither employed, nor unemployed during the reference period, including those who were either unable to work or unavailable for work. It also includes persons who were without work and who had neither looked for work in the past four weeks, nor had a job to start within four weeks of the reference period. For example, persons who are caring for their children, those who have other personal or family responsibilities, or students are considered to be not in the labour force. Public service refers to all levels of government (hamlet/municipal, territorial and federal) unless otherwise specified. Interest in government employment refers to persons who responded "yes" or "maybe" to the question "Would you be interested in working for the government or hamlet in Nunavut in the next two years?" and those who responded "yes" to the question "Would you ever be interested in working for the government or hamlet in Nunavut (again)?"